Abstract. We present ice-penetrating radar evidence for ancient (pre-glacial) and extensive erosion surfaces preserved beneath the upstream Institute and Möller ice streams, West Antarctica. Radar data reveal a smooth, laterally continuous, gently sloping topographic block, comprising two surfaces separated by a distinct break in slope. The erosion surfaces are preserved in this location due to the collective action of the Pirrit and Martin–Nash hills on ice sheet flow, resulting in a region of slow flowing, cold-based ice downstream of these major topographic barriers. 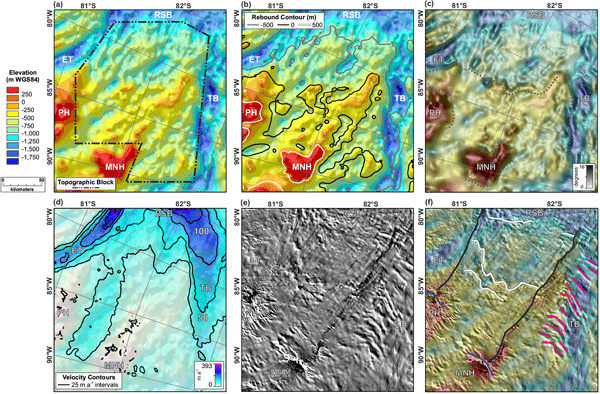 Our analysis reveals that smooth, flat subglacial topography does not always correspond to regions of either present or former fast ice flow, as has previously been assumed. We discuss the potential origins of the erosion surfaces. Erosion rates across the surfaces are currently low, precluding formation via present-day glacial erosion. We suggest that fluvial or marine processes are most likely to have resulted in the formation of these surfaces, but we acknowledge that distinguishing between these processes with certainty requires further data. How to cite: Rose, K. C., Ross, N., Jordan, T. A., Bingham, R. G., Corr, H. F. J., Ferraccioli, F., Le Brocq, A. M., Rippin, D. M., and Siegert, M. J.: Ancient pre-glacial erosion surfaces preserved beneath the West Antarctic Ice Sheet, Earth Surf. Dynam., 3, 139-152, https://doi.org/10.5194/esurf-3-139-2015, 2015. We use ice-penetrating-radar data to identify a laterally continuous, gently sloping topographic block, comprising two surfaces separated by a distinct break in slope, preserved beneath the Institute and Möller ice streams, West Antarctica. We interpret these features as extensive erosion surfaces, showing that ancient (pre-glacial) surfaces can be preserved at low elevations beneath ice sheets. Different erosion regimes (e.g. fluvial and marine) may have formed these surfaces.